Given that there are approximately 11 million candidates for the Democratic nomination, you could be forgiven for not having heard of Yang. He is currently polling at one percent; 59 percent of those polled have never heard of him. He has never held high office, his only claim to political fame being brief recognition by the Obama White House. But Yang’s quixotic run has attracted attention, and a few supporters, for its far-out message. He believes that 21st-century automation is going to lead to mass technological unemployment, which will bring social disaster. That is, unless, we implement Yang’s proposed “freedom dividend”: a $1,000-per-month payout to every American ages 18 to 64, which will provide a “universal basic income” to all. A UBI, as such a program is known, is and remains a hot topic in the worlds of poverty and technology policy. Debate over the idea is not merely empirical, although there are large-scale trials of how UBIs affect communities, but also philosophical. What would it mean to shift into a world where people did not have to work to live? Many UBI proponents view the idea as liberating, freeing people from the oppression of work. But the picture that Yang paints is far more paternalistic than liberating. The operative question for understanding The War on Normal People is this: who are normal people? It is not the people with whom Yang regularly associates, or whom he expects to be reading his book. This is true: about a third of Americans have college degrees, meaning two-thirds do not. The modal American has either a high school degree or some college, depending on when he was born. However, because people tend to cluster with and marry their status peers, if you are an American in the top third, that probably means most of your peers are also in the top third, and your “normal” is not really normal at all. This was certainly Yang’s experience. He attended Brown and Columbia, was a corporate lawyer for five months, then left to run an education start-up which he eventually sold for millions of dollars. He lived in New York, surrounded by college graduates who had left their homes across America to make their fortune on Wall Street. Yang realized that while he and his peers thrived, the rest of America stagnated. Decades ago, the benefits of the American economy tended to accrue to “normal” Americans, working in manufacturing or service industry jobs. But, as economist Tyler Cowen (by whom Yang is clearly influenced) has argued, technological progress has led to an increasing bifurcation. Today, a small cohort of high-skill individuals accrue more and more premium for their talents, while the “normal” Americans are more and more often out-competed by automation. That last point bears emphasizing: the coming apart about which Cowen wrote, and about which Yang is so concerned, is expected to be driven by the substitution of humans in low-skilled work—how “normal” Americans make a living—for robots, AI, and other kinds of automation. Technological unemployment will not fall equally, but massively exacerbate preexisting inequality. Yang is convinced that mass automation is already here, and that it explains, among other things, the election of Donald Trump. Experts are not so sure, suggesting that current trends in manufacturing automation do not explain a lot of the recent decline in jobs in that industry. There is not even exactly consensus that automation will reduce employment in the long-run, with estimates ranging from 890 million jobs created to one billion jobs destroyed in the next five to 10 years. But Yang does not need to show that everyone’s job is going away, just that certain jobs are more readily automatable than others. A 2013 Oxford study estimated that 47 percent of U.S. jobs were automatable, and that the lower one’s wage and education level, the more likely one is to be automated. Yang points to office and administrative support jobs (22 million employed), retail (14.5 million), food prep (12.9 million), trucking (9.7 million), and production (9.1) as all ripe for replacement with machines. With this, Yang predicts, will come enormous social upheaval: drug overdoses, suicide, and eventually violent revolution. At the culmination of the second section of the book, he outlines a lurid vision of a mass trucker rebellion, leading to riots, the rise of a white nationalist party, and eventually secession by the state of California. It is this fear that ultimately underlies Yang’s political program. The UBI is a redistribution from the wealthy few to pay off the stagnant many to forestall revolution. Certainly, Yang frames his “freedom dividend” as a way to set people free from work, to have the freedom to become entrepreneurs (even though, he has already conceded, most people cannot survive in the entrepreneurial world). But in his mind, the UBI is really about solving mass displacement by moving more and more Americans into the arms of government. Acknowledging this lends a sinister hue to some of his other proposals. “Modern time banking,” where governments give people credits for doing pro-social things in their communities, is a gateway to a social credit system. A federal oversight authority to check “fake news” dangerously imposes on First Amendment rights. Free, AI-enabled marriage counseling (yes, really) provides a venue for further state involvement in the family sphere. Perhaps this interpretation seems alarmist; Yang certainly does not mean to design an authoritarian America. But his basic premise is that a revolution is coming, and the solution seems to be the expansion of government power to keep the “normal people” from rising up against their entrepreneurial overlords. Technological unemployment is a real problem, and likely only to grow in the next ten years. It is heartening to know that there is a candidate for president who is taking it seriously. But Yang’s solutions suggest that the only possible way out is a growth in the number of government vassals. A more robust approach—one that tries to envision how everyone can be included in 21st century work—would not be merely more sound, but far less dangerous to American liberty. 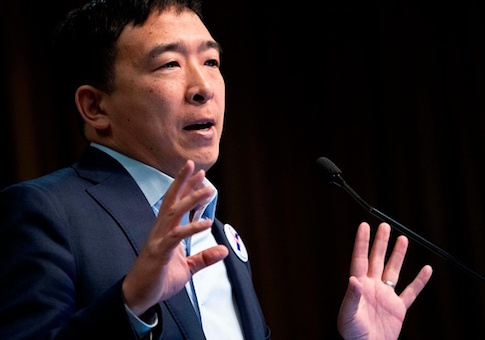 The post Andrew Yang and the Normies appeared first on Washington Free Beacon.